A dramatic start to the day, it could hardly have been more dramatic, the top two seeds in the Mixed Doubles event both fell at the opening hurdle; further both fell to outfits from the Korean Peninsula. 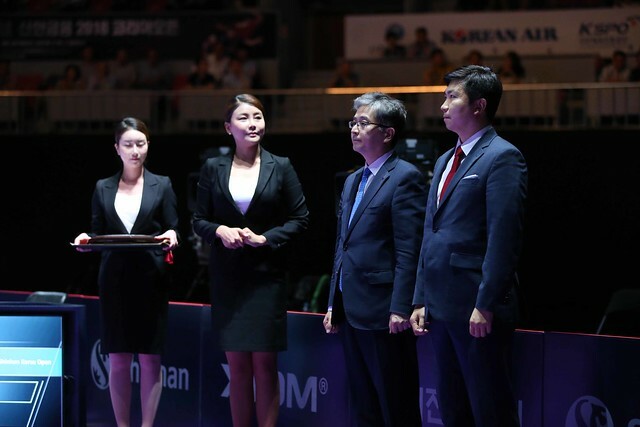 On the morning of Thursday 19th July at the Seamaster 2018 ITTF World Tour Platinum Shinhan Korea Open, the DPR Korea duo of Pak Sin Hyok and Kim Nam Hae, alongside the united partnership of the host nation’s Jang Woojin and his partner from north of the border, Cho Hyo Sim, upset the order of merit. Pak Sin Hyok and Kim Nam Hae beat Masataka Morizono and Mima Ito, the top seeds and reigning Japanese national champions (11-5, 8-11, 11-5, 7-11, 14-12); Jang Woojin and Cho Hyo Sim accounted for Hong Kong’s Wong Chun Ting and Doo Hoi Kem, the no.2 seeds (8-11, 11-8, 11-9, 11-8). Upsets but in realistic terms the only surprises in the first round of the Mixed Doubles event, the one other demise of a seeded pairing was technical rather than practical; Japan’s Tomokazu Harimoto and Hina Hayata, the no.7 seeds, were forced to withdraw owing to injury to the latter; thus giving China’s Wang Chuqin and Sun Yingsha, a walk-over. Success for the seeded outfits but there was a close call; Lin Gaoyuan and Wang Manyu, the no.6 seeds and arguably favourites for gold, needed the full five games to beat the Slovak Republic partnership of Lubomir Pistej and Barbora Balazova (3-11, 11-2, 8-11, 11-2, 11-4). Otherwise it was success for the pairings who had received direct entries without moments of great drama; notably the host nation was very much in evidence. Lee Sangsu and Jeon Jihee, the no.3 seeds, beat Choe Il and Yoo Eunchong, a combination of North and South Korea (11-5, 9-11, 11-7, 13-11); Lim Jonghoon and Yang Haeun, the no.8 seeds, overcame India’s Sathiyan Gnanasekaran and Manika Batra (10-12, 11-7, 11-2, 14-12). Meanwhile, in the remaining contests, the all-Chinese Taipei duel witnessed success for Chen Chien-An and Cheng I-Ching, the no.4 seeds, in opposition to Chuang Chih-Yuan and Chen Szu-Yu (11-6, 11-5, 14-12); whilst Hong Kong’s Ho Kwan Kit and Lee Ho Ching, the no.8 seeds, ended the hopes of Singapore’s Gao Ning and Yu Mengyu (11-4, 11-8, 11-5). At the quarter-final stage Pak Sin Hyok and Kim Nam Hae meet Wang Chuqin and Sun Yingsha; Lim Jonghoon and Yang Haeun confront Lee Sangsu and Jeon Jihee. In the opposite half of the draw it is Chen Chien-An and Cheng I-Ching versus Lin Gaoyuan and Wang Manyu; Ho Kwan Kit and Lee Ho Ching versus Jang Woojin and Cha Hyo Sim. The quarter-final matches are scheduled for later in the day in the evening session of play.